Fairborn’s Evelyn Oktavec (10) tries to draw a charging foul against Oakwood’s Lauren Hapgood (14), during the second half of Tuesday’s Nov. 27 girls high school basketball game in Fairborn. Hapgood led all scorers with 27 points, while Oktavec finished with 12, in the Skyhawks’ win. Fairborn’s Khala Powell (1) drives in for a layup in the first half of a 52-49 Skyhawks win over visiting Oakwood. Powell led Fairborn with 15 points scored. 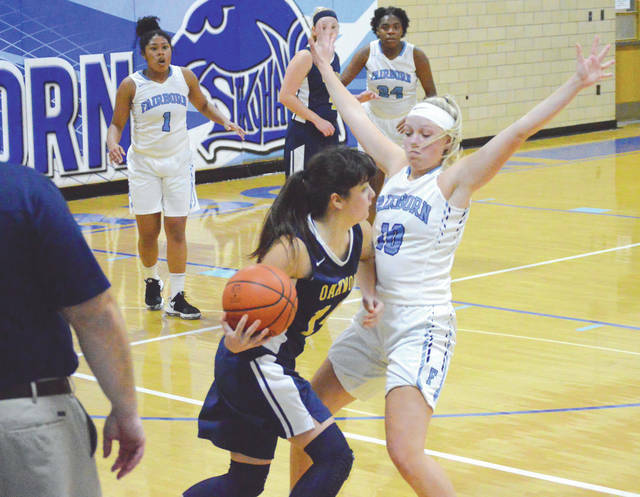 FAIRBORN — Despite a bevy of fouls on both sides, host Fairborn withstood a late Oakwood rally to claim a season opening 52-49 win, Tuesday Nov. 27 in the Baker Middle School gym. The Skyhawks held a solid 31-19 lead at the half, but the upset minded Oakwood Jills chopped away at the lead throughout the second half. Oakwood went on a 9-0 scoring run in the final 80 seconds of the game, but Fairborn’s Khala Powell converted the front end of two free-throw tries with 11 seconds left, and then hit the back end of two more tries with 7.7 ticks left on the game clock, to keep the Skyhawks out front for good. 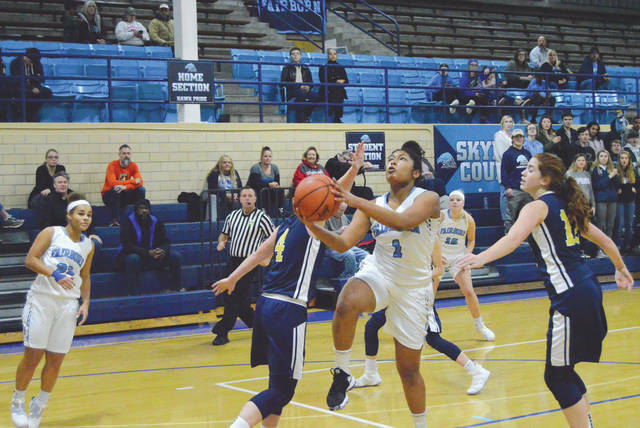 Three Skyhawks players fouled out in the fourth quarter of Tuesday night’s game, and two others finished the game with four fouls. Oakwood had two players also foul out of the contest. Powell led the Skyhawks with 15 points scored, nine of which came in the first half. Evelyn Oktavec scored a dozen points, Jodee Austin finished with nine points and Aria Cole added seven in the season opening win. Jills senior guard Lauren Hapgood nearly rallied Oakwood on her own. The Oakwood co-captain finished with a game-best 27 points and hit 13 of 18 tries from the free-throw line. Kylie Foos was the other Oakwood player to score in double figures with 10 points. “It’s always tough to open up the season on the road. We wanted to come here. They’re obviously a Division I school and a high-quality basketball program, and that’s what we wanted to start with, and that’s where we’re trying to get as a program,” said Oakwood coach Matt Salyer. “I’m happy. I’m proud of the girls. They’ve worked really hard in practice, and they didn’t quit, that’s all I can ask. Fairborn doesn’t have much time to rest on its laurels. The Skyhawks will host powerhouse Trotwood-Madison for a 7:30 p.m. contest on Wednesday, Nov. 28 at Baker Middle School. 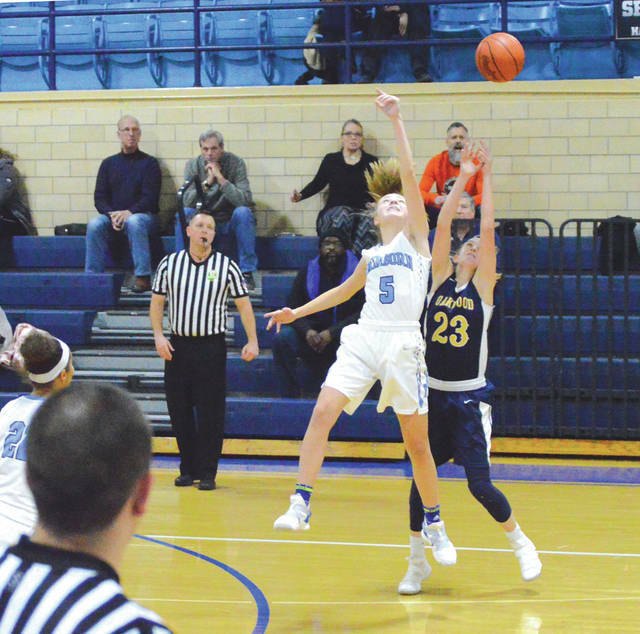 Oakwood gets a day to regroup before beginning Southwestern Buckeye League Southwestern Division play with a 7:15 p.m. Thursday, Nov. 29 home game with Franklin.